of Harleysville and Lansdale, Pa.
We are glad that you are interested in nursing your baby. We are a group of women who either are now nursing or have successfully nursed babies of our own. Our counselors are professionally trained to help you with the techniques of breastfeeding and to give you information and support. We are available on a 24-hour basis if you need help, advice or just someone to talk to. Available at our meetings is our lending library with books on childbirth, breastfeeding, child care and parenting. You are welcome to borrow any of our books. We request that you return them the following month if at all possible. Also available are free pamphlets about breastfeeding. Please feel free to call us at any time, if just for a good listening ear. 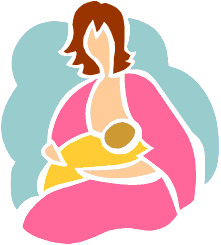 Nursing Mothers does not require you to "join", and there are no dues; we are strictly a non-profit volunteer organization offering assistance on a mother-to-mother basis. Our goal is to help you have a positive breastfeeding experience for as long or as short as you wish.